It has been almost 10 years since 2,000 Georgian soldiers – most of the Georgian army – took part in the Pentagon-sponsored “Training and Modernisation Program” between 2001 and 2002. Kosovo had been the first precedent for Georgian participation in international peacekeeping operations, but in those years, the number of soldiers sent to world's geopolitical hot spots was not overly significant. For example, less than 100 Georgian soldiers were deployed to Kosovo, and they served among the ranks of the German contingent. With the beginning of the wars in Afghanistan and Iraq, Georgia's role became more active but during the Shevardnadze administration, Georgian soldiers in Afghanistan and Iraq numbered no more than between 100 and 150. With Saakashvili's rise to power, the situation changed radically. Georgian troops, both in Iraq and, later, in Afghanistan, reached the considerable number of 1,000. Georgia would not seem to have any reason to go and fight in faraway Afghanistan, let alone Iraq. But politics makes the difference in this case. The first reason for Georgia's active participation in someone else's wars is the country's desire to show Western partners that it can give something back. Over the last two decades, Tbilisi constantly needed the West's support; in Afghanistan and Iraq Georgia can prove to be a useful and willing ally. Until recently, Georgian politicians explained that Georgia's presence in Iraq and Afghanistan would hasten the country's entry into NATO, but this argument does not hold water any longer. Joining the Alliance has become a merely theoretical possibility for Georgia. The second explanation is, again, political. 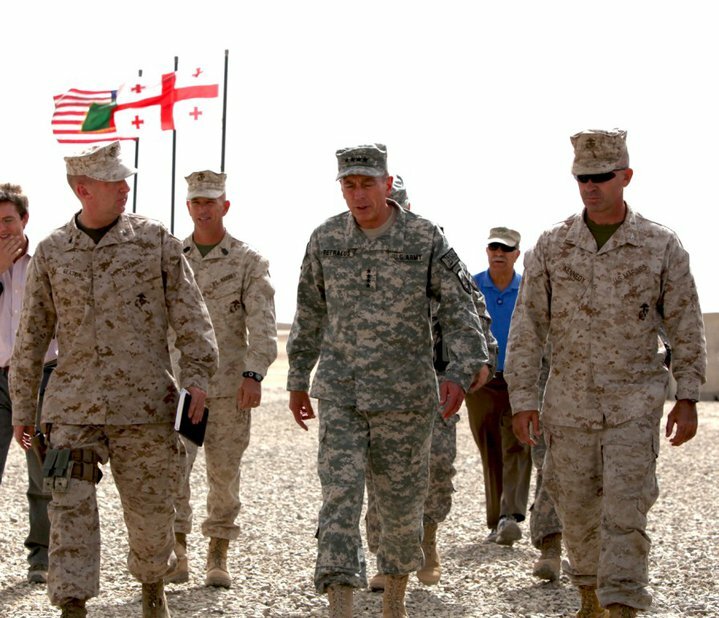 An active military presence, first in Iraq, then in Afghanistan, significantly increases the ruling elites' rating in Western eyes, and especially in the eyes of the US. US President Barack Obama has repeatedly expressed his gratitude for Georgia's support in Afghanistan, as did State Secretary Hillary Clinton on more than one occasion during her visit to Tbilisi. Such statements are obviously directed at the country as a whole rather than just at the current government, but Georgia may well keep only 100 soldiers in Afghanistan if it wasn't for Saakashvili's and his team's active support. The public opinion is not especially enthusiastic about 1,000 Georgian soldiers fighting who-knows-where and for who-knows-why, but since they do it on a voluntary basis, nobody expresses too much concern. In addition, the participation in international military operations is not funded by Tbilisi but by the U.S. Most opposition parties are not especially enthusiastic about Georgia's participation in international military operations but do not protest too much for realpolitik's sake. Their only concern is the possibility of Western allies forgiving the Georgian government's violations of democratic rules in exchange for Georgian participation in the Afghanistan war. Namely, Republican party leader Davit Usupashvili expressed support for the mission, but specified that “it is crucial for us that Georgian authorities do not exploit the situation for blackmailing the West. The US and their allies must not close their eyes on the violations of democracy in Georgia just for our soldiers' participation in their war”. Between 2007 and 2008, over 2,000 Georgian soldiers were fighting in Iraq, making Tbilisi's contingent one of the most important, in numerical terms, in the whole coalition. They left urgently on 9 August, 2008 when Georgia fought Russia, but they arrived home too late to play any role in the conflict. After that, the troops were not sent back to Iraq, since by then it was already clear that Barack Obama would win the US presidential elections and that his new administration would aim at downsizing the military presence in Iraq. During the time the Georgian army was most active in Iraq, less than 100 soldiers were fighting in Afghanistan. In 2009 when the US defined their priorities, the Tbilisi government announced intentions to increase its contingent by up to 900 units. Currently, 925 soldiers are deployed in Afghanistan. The Georgian contingent is the second largest after the US in size considering its population and the first in relation to national GDP. The first Georgian death was registered in Afghanistan's Helmand province on 5 September when a soldier was killed and two were wounded, one losing both legs. Judging from the attitude of both the government and the main opposition forces, Georgians not preparing to downsize its military presence in Afghanistan.The reason is, by now, clear: the country's participation in international operations is the only context in which the country feels on equal footage with its Western counterparts. But another question remains unanswered: when and how may Georgia use the military experience it gained in Afghanistan and Iraq?